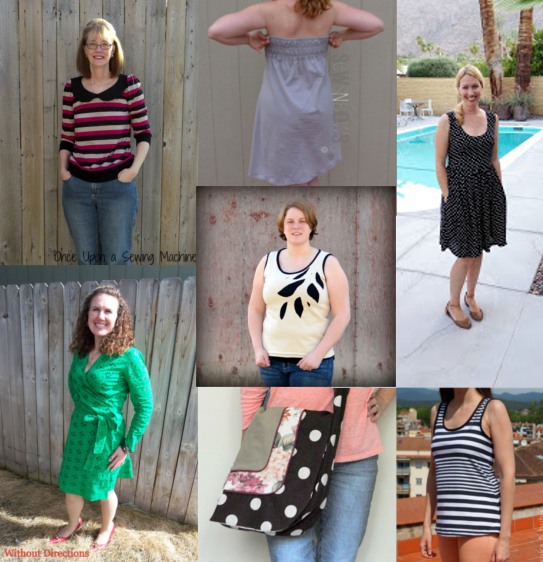 It’s been over a week since our last Sew-a-bration post and I’m still marveling at all the great looks that were added to the linky. I am honored to be a part of a series this good and thank the Shaffer Sisters for asking me to cohost. It was a fun month full of lots of inspiration, so let’s take a quick look at some of my favorite things that were linked. Donna from Once Upon a Sewing Machine’s striped Parisian Top – The Parisian is one of my favorite styles. Amy from Sews N Bows’ Simplicity 1804 – I love how the back turned out! April from Modern Handmade’s Polka Dot Angie Dress – Anniversary vacation to Palm Springs? Yes please! Kuka & Bubu’s Plantain Tee Variation – I love it as a tank. Nutta’s Asymmetrical Bag – It’s great seeing all of these new bags (pattern by Serger Pepper) popping up! Major Moma from Without Directions’ Burdastyle Wrap Dress – That green eyelet is lovely. Audrey from Skirt Fixation won Bundle #1! Amy from Sews N Bows won Bundle #2! Michelle from Falafel and the Bee won Bundle #3! I'm still so obsessed with this series. A little sad it's over!! Thanks so much to you, scary & the Sisters, and all the women who sewed for it. It was inspiring and such a positive experience. The Shaffer Sisters had a great idea didn't they? I love the series and was so happy so many of you participated! There was so much good stuff shared that I barely even saw it all! I think there is still a lot out there I need to look through. I'm really inspired to make a lot more for myself this summer. Thanks for joining in Amy! And congrats on winning the bundle! I'm still dying over that. I absolutely can't wait to start getting goodies! I must've done something nice because I'm getting blessings left & right. YIPEE! We won! Thank you so much for hosting this thoughtful series…we loved it!